Very good transparency, but bad seeing and wind disturbing the observation. The aureole (V band, is seen first in correspondence of the pole of Venus, well before 1st contact. Credit : P. Tanga, Laboratoire Lagrange, Obs. de la Côte d'Azur; K. Brausch, J. Roberts at Lowell Observatotry; - Venus Twilight Experiment: P. Tanga, Th. Widemann, Observatoire de Paris/LESIA, CNRS, UPMC, Université Paris-Diderot. 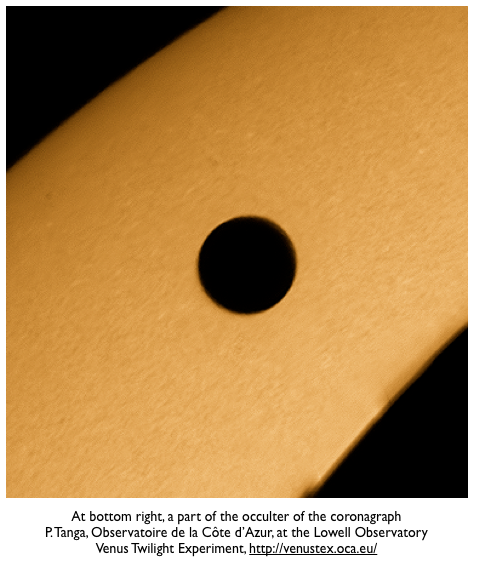 Observation at Venus egress, Felipe Braga Ribas and Len Fulham, Moondarra station, near Mount Isa, Australia (screen copy, VTE coronagraph with a Merlin-Raptor camera). The aureola remains strongly assymetrical between contacts 3 and 4. 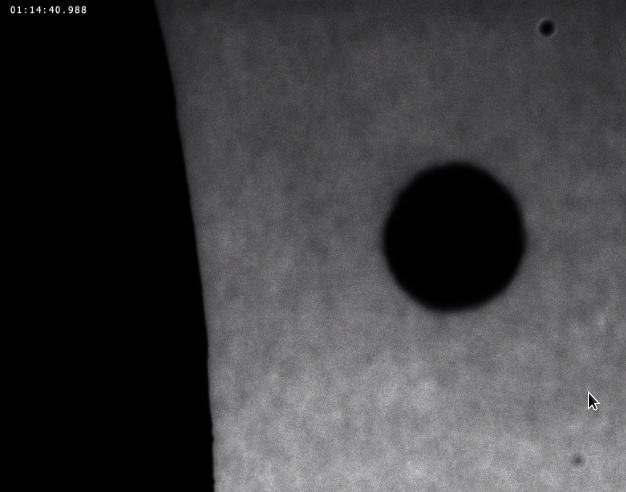 It is much more intense in the North pole region on Venus, and streaks across the chomosphere in this image taken with an I filter at 760 nm (bandwidth 10 nm). Credit : Felipe Braga-Ribas, Observatoire de Paris/LESIA, Len Fulman, Moondarra Observatory / Mount Isa / Australia. - Venus Twilight Experiment: P. Tanga, Laboratoire Lagrange, Obs. de la Côte d'Azur ; Th. Widemann, Observatoire de Paris/LESIA, CNRS, UPMC, Université Paris-Diderot. Observation at Venus egress, Jérôme Berthier and Thomas Widemann, Longyearbyen, Svalbard, Norway (screen copy, VTE coronagraph with a DMK-41 camera). The aureola remains visible and highly assymetrical after contact 4. It is much more intense in the North pole region on Venus, in this image taken with an I filter at 760 nm (bandwidth 10 nm). Left : Image taken during the course of the transit. The photosphere is not saturated and shows granulation. 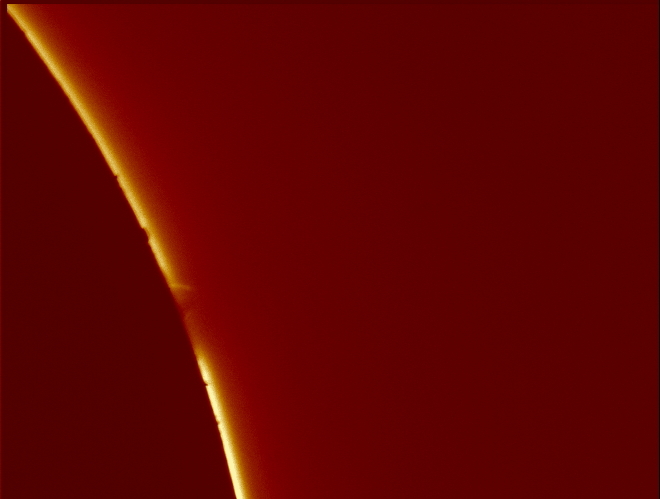 On the left is the coronagraph's occulting disk momentarily moved away from the solar western limb to track Venus before the egress sequence. 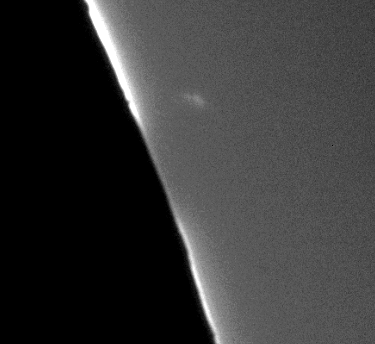 Right : immediately after fourth contact at 4:53 UT (6:53 CEDT). 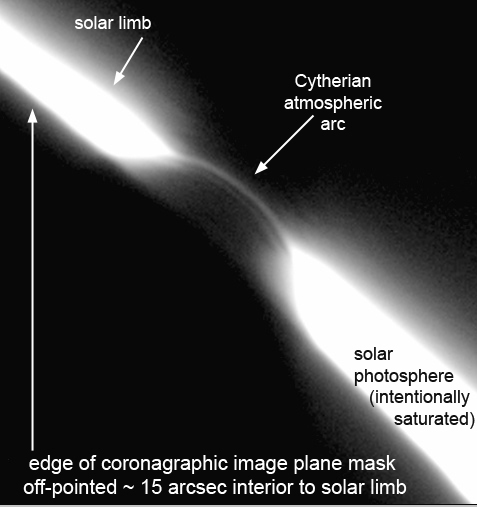 The refracted sunlight causing the aureole is mainly visible in the North polar region of Venus' atmosphere. Image in I band at 760 nm (bandwidth 10 nm). Credit : Jérôme Berthier, Observatoire de Paris/IMCCE, and Thomas Widemann, Observatoire de Paris/LESIA. - Venus Twilight Experiment: P. Tanga, Laboratoire Lagrange, Obs. de la Côte d'Azur ; Th. Widemann, Observatoire de Paris/LESIA, CNRS, UPMC, Université Paris-Diderot. 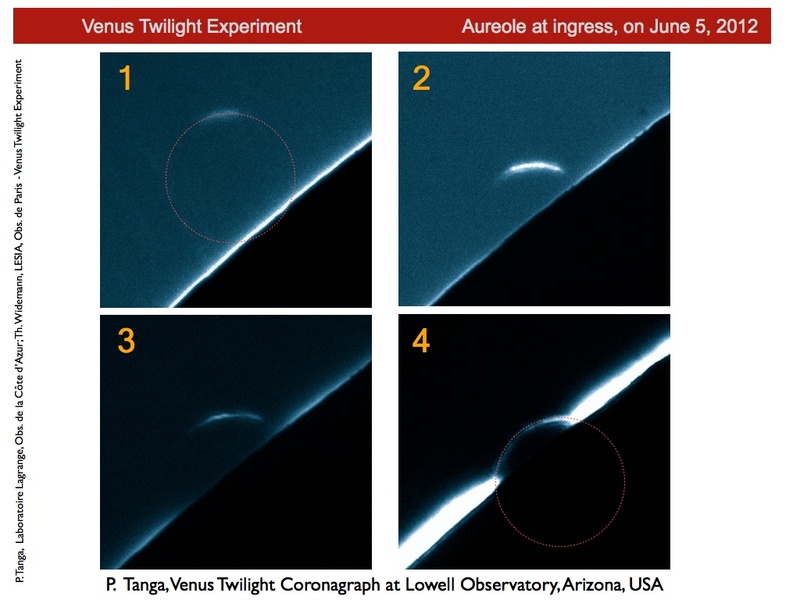 Credit : Jay M. Pasachoff, Bryce A. Babcock, M. Lu (Williams College) and G. Schneider (Steward Observatory, University of Arizona); - Venus Twilight Experiment: P. Tanga (Laboratoire Lagrange, Obs. de la Côte d'Azur); Th. Widemann (Observatoire de Paris/LESIA, CNRS, UPMC, Université Paris-Diderot).